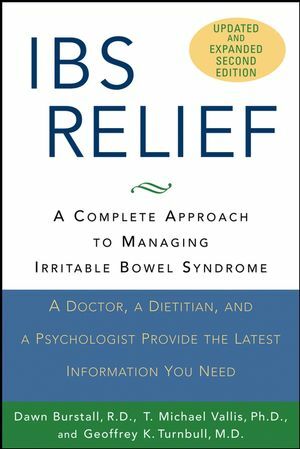 IBS Relief, Second Edition is an extensively updated, hands-on guide to help you manage your symptoms and limit the frequency, intensity, and duration of irritable bowel syndrome (IBS) episodes. Written by a doctor, a dietitian, and a psychologist, this guide gives you a multidisciplinary approach encompassing every proven strategy for managing IBS, including new drug therapies and stress management techniques. This book gives you the tools, the techniques, and the information you need to make specific lifestyle and diet changes that can bring real relief. Dawn Burstall, R.D., T. Michael Vallis, Ph.D., and Geoffrey K. Turnbull, M.D., work together in the gastroenterology program at Capital Health, a large teaching hospital in Halifax, Nova Scotia. 2. How Do I Know I Have Irritable Bowel? 3. How the Gut Works, and Sometimes Doesnâ??t. 4. What Causes Irritable Bowel? 5. Want Relief? Start with Healthy Eating. 6. Foods and Habits That Irritate. 7. Healthy Eating Adjustments for Specific Symptoms. 8. What Is Stress, and Does It Affect Irritable Bowel? 10. What Do I Do about the Pain? 11. Are You Ready? Making Change Happen. 12. Irritable Bowel Is Not My Only Worry. 13. Working with Your Doctor. 14. Living with Irritable Bowel.